The British government, like many others around the world, have been developing chemical weapons since the First World War – and continue to do so from Porton Down. However, unlike others, the Conservative government were complicit in the sale of these deadly banned weapons to Syria. The Department for Business, Innovation and Skills granted licences for the sale of chemical weapons ingredients and components to Syria ten months after the uprising began. There is a type of hypocrisy coming from the current crop of politicians that has learned nothing at all from the international embarrassment that emanated from Britain’s awful foreign policy choices when Tony Blair blindly followed the Americans and led the country into killing a million people in Iraq that even to this day has three million displaced from their homes. David Cameron saw fit to do the same in Libya. Many were killed, hundreds of thousands displaced and today the country in is the hands of gangsters and terrorists who make money in slave trading markets and sending millions of migrants across the Mediterranean that is currently destabilising Europe. Theresa May has sought exactly the same route from the same playbook of lies and deceit. The Skripal/Novichok/it was Russia story has been roundly discredited. It was clearly the precursor to blaming Russia for protecting its ally, prior to attacking Syria without either the authority of the UN or debate in parliament, where 78 percent of Britain’s disagree with Theresa May’s air strikes. The airstrikes were carried out on a pretext of the use of chemical weapons – which has now been fully discredited as well. Robert Fisk via The Independent brought us that evidence yesterday – that no chemical gas attack took place in Douma. We have had very firm confirmation from the Obama administration back in 2014 that the British made nerve gas stockpiles were completely extracted from Syria. “We struck a deal where we got 100 percent of the chemical weapons out,” declared then-Secretary of State John Kerry on Meet the Press in 2014. Kerry was referring to Bashar al-Assad’s declared stockpiles of chemical weapons which, under a 2013 deal struck by the Obama administration following a sarin nerve gas attack that brought the U.S. to the brink of striking Syrian government forces, were dismantled and shipped out of the country. We have conclusive evidence that Britain manufactured and sold nerve agents to Syria even during the first year of the uprising. We have evidence that ISIS backed terrorists did use chemical weapons as confirmed by the United Nations (see below) that was a ‘red-line’ for the Obama administration. We have more evidence that these so-called ‘rebels’ used gas attacks as confirmed by the US State Department (see below). We have concrete evidence that nerve agents sold by Britain were handed over via a diplomatically brokered deal that included the UN, US, Britain and Russia – to the complete satisfaction of all concerned. We have confirmed evidence that no chemical weapons attack took place in Douma contrary to the Trump and May administrations allegations. Like Blair and Cameron before her, we have been provided little more than circumstantial evidence from Theresa May and her cabinet that only goes as far as ‘highly likely‘ and ‘suspected,‘ almost all of which cannot be verified, much of which, can be discredited. “British companies supplied ingredients for the production of the deadly nerve agent sarin to Syria in the 1980s, a secret Foreign Office document obtained by Newsnight has revealed. Sarin has been linked to several attacks during Syria’s three-year civil war, including last year’s deadliest, in which almost 1,500 people were killed, including 426 children. 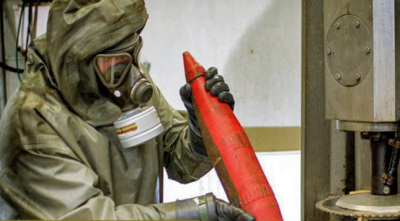 The report names the UK as the sole supplier of the three key ingredients used to produce sarin; dimethyl phosphate (DMP), trimethyl phosphate (TMP) and hexamine. These three chemicals are regarded as the “building block” of sarin. Sarin is described by chemical weapons experts as one of the “deadliest agents known to man”. It is classified as a weapon of mass destruction as a small amount is capable of killing thousands of people, as was evident in Syria. “Testimony from victims strongly suggests it was the rebels, not the Syrian government, that used Sarin nerve gas during a recent incident in the revolution-wracked nation, a senior U.N. diplomat said in 2013. But she said her panel had not yet seen any evidence of Syrian government forces using chemical weapons, according to the BBC. Damascus has recently faced growing Western accusations that its forces used such weapons, which President Obama has described as crossing a red line. But Ms. del Ponte’s remarks may serve to shift the focus of international concern. Last September, the US Department of State Consular Affairs offered official Syria travel warning for American citizens: that the core rebel group currently operating in northwest Syria not only possesses but has used chemical weapons – to the point that the State Department considers it a major enough threat to publicly warn citizens about. The armed opposition group, Hayat Tahrir al-Sham (HTS), is referenced early in the document: “Terrorist and other violent extremist groups including ISIS and Al-Qaeda linked Hayat Tahrir Al-Sham [dominated by Al-Qaeda affiliate Jabhat Al-Nusra, a designated Foreign Terrorist Organization], operate in Syria.” The document clearly names terrorist groups operating in Syria who use tactics such as suicide bombings, kidnappings and chemical weapons – to target major city centres and open spaces.